He Of Three Names: Skirmish Gaming Frenzy! Welcome back readers! Its been a busy couple of months and I've got some great games in with people from all over the US community. Over the summer I got together with Grove and Maj Guiscard in Illinois to play a weekend campaign, The Fight for New Texas. It was a great campaign which you can read up on over on Give 'em Lead and The Governor General of Sector Six. I also made it over to Historicon in Lancaster and had a bit of an impromptu Oldhammer USA meetup. Last weekend was Oldhammer US in New Jersey, and we are just wrapping up Monolithcon III in Illinois again. 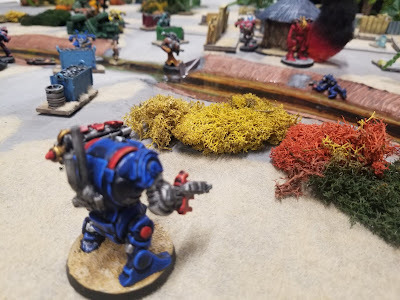 Over the past few months, I've had a chance to put several rule sets and house rules to the test and have come up with great ideas for developing a framework for a campaign. I'll cover some of those rules and what I thought worked well and what didn't. 1) Conducive to narrative style game play. 2) Facilitates a realistic simulation of combat. The best example I can think of a game that meets all these criteria out of the box without any house rules is Mordheim, easily one of the best fantasy skirmish games ever written. Mordheim hits every one of these points out of the park. My only complaint would be that the rules don't allow the player to have a true open world, sandbox type approach to warband selection. Much like Necromunda, it doesn't facilitate a build-your-own band approach. 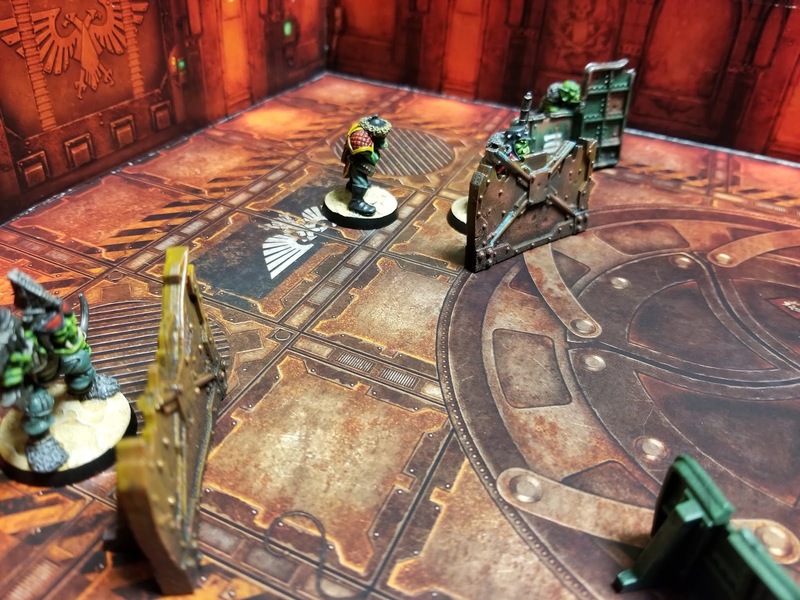 I got a chance to run through a few of the scenarios from the Necromunda Underhive boxed game with Grove last month. Overall, I really like this game. I enjoy that the game got away from the old "I go, you go" turns, I really like the ammo and injury dice mechanics. The campaign system is really what makes Necromunda shine. While I like the injury/recovery system, it does get a bit cumbersome. 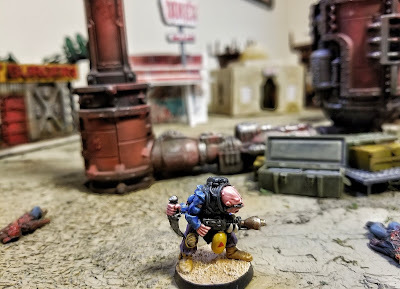 This works fine for Necromunda, but if it were to be adapted to a bigger game (platoon sized), it would quickly get very annoying as you would have loads of turned over models littering the tabletop. 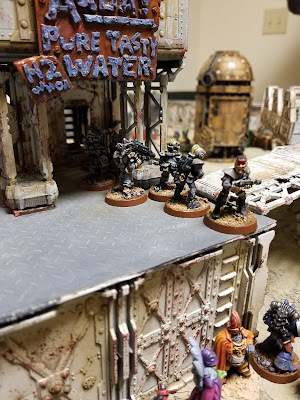 I really like Necromunda, but five to ten models is a bit too small scale for my taste. Another fun rule set, easily turned into a sci-fi western with less than ten models per side. This game is a no-brainer for anyone who like the spaghetti western in space aesthetic. 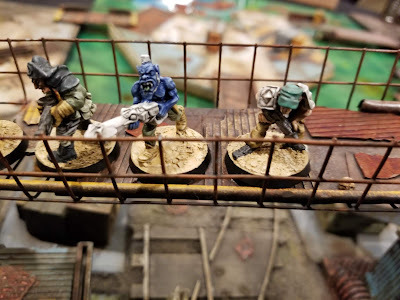 If you have a couple Rogue Trader miniatures laying around, you should give this game a shot. The game itself is quick and intuitive, a simple but satisfying combat system, and it has werewolves! Dracula's America has gotten a bit of traction in the Oldhammer community. You can check out Magpie and Old Lead, Sho3box, and Leadplague for more Draculas America goodness. 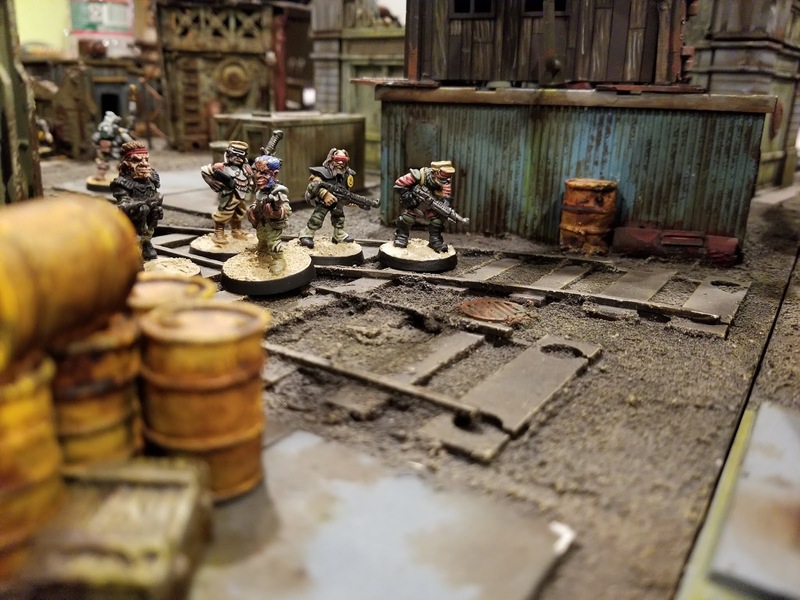 These guys are doing some inspiring stuff with their Rogue Trader collections. Dracula's America also has a great campaign system, but gets a bit cumbersome when your posse gets close to ten models. If you're looking for a really easy and fun game that you can easily modify to fit your model collection, Dracula's America is it.... we'll all just have to get over the fact that Osprey Games just doesn't do convenient layouts in their rulebooks. What can I say about Rogue Trader that hasn't already been said? It's wonderful, its great, it's everything you could ever want... and everything you don't want. Let's start with what I like: The background, the weapons and equipment, the Warhammer combat system. What I don't like, the clunky mechanics for robots, vehicles, aircraft. You simply can't play a game of Rogue Trader without a game master. Also, once you've gotten away from "I go you go", there's really no turning back. I love Rogue Trader, but there's a reason I modified it to Rogue Ops, and it has become a favorite of my core gaming group. So.... I don't want to sound like a megalomaniac, but my Rogue Ops homebrew/houserules/mashup is really what does it for me. It still needs to be refined. 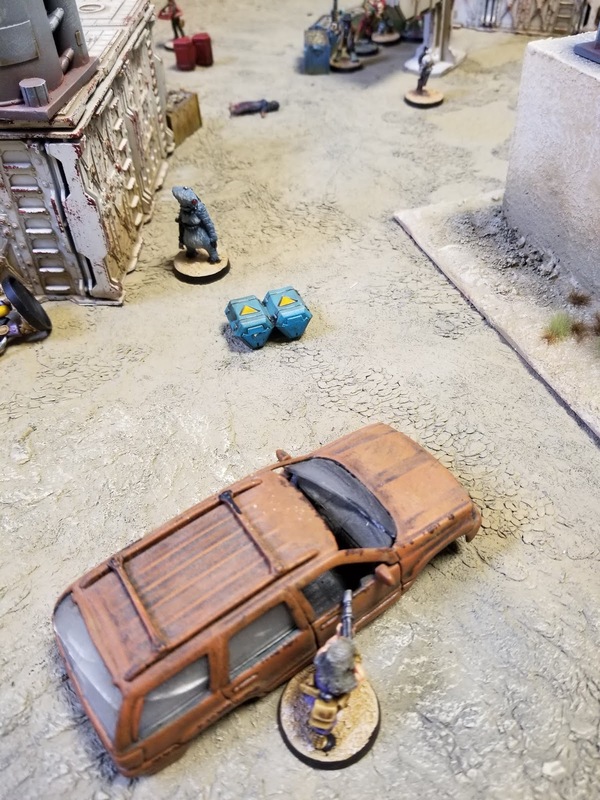 I doubt anyone other than myself or maybe Grove could actually run a game of Rogue Ops, but after trying out several games over the past two months it seems to be the one set we will stick with. The mashup of the combat systems from Warhammer and Black Ops has resulted in a uniquely satisfying and fast system that people really seem to enjoy. I still haven't done very much work on character/warband creation, there is no system for balancing forces, and no campaign or progression system whatsoever. The problem with Rogue Ops is that the house rules, as written, are too loose. As I mentioned before there are only two people who could run a game of Rogue Ops. With that in mind, my focus for the next six months will be to produce a well written set of rules that anyone familiar with and has access to Rogue Trader and Black Ops can pick up and play. I look forward to coming up with something that I hope other people can enjoy as much as I do. Interesting read Lopez. Trying to find the "right" rule system is the ever elusive holy grail for just about every gamer I'd think. When looking at rule sets that you think are worth modding, deciding which bits you should retain and which should be thrown out can be a difficult task. Throw out too much and you run the risk of diluting the original down to the point of it being unrecognisable. retain enough so that it's "still the same game" and we then have to ask ourselves "are we just keeping it for the sake of nostalgia?" I haven't played black-ops yet, but I'd love to give it a try. Especially after you've worked your magic over it. I'm keen to see what all the excitement is all about. Very interesting article and an enjoyable read (especially love seeing the old lead) - In terms of skirmish-level rule sets that also support slightly larger game sizes, I am a big fan of (and would heartily recommend) 'Wasteman' by Thunderchild Miniatures. It might seem like an unusual choice, but the system is very well-written and *very* reminiscent of Rogue Trader/Confrontation (especially in terms of arming and equipping), but still features more modern elements like action points and alternate activations. Good article. I for one really enjoy Rogue Ops. I fully support your idea to fine tune and expand the system to include more warband progression/ campaigns. Enjoyed the article. 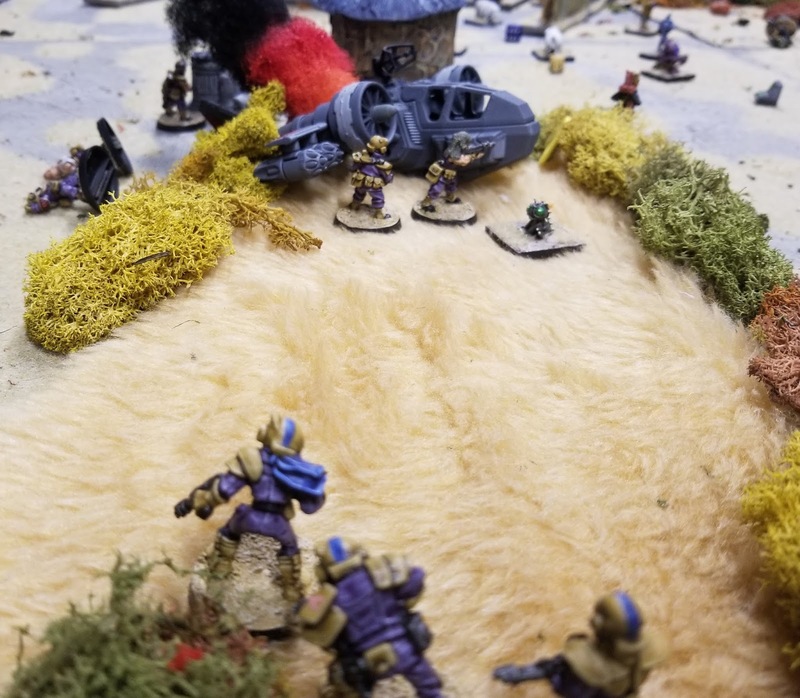 I have done something similar- taking 40K 3-7; keeping most of the rules, playing loose with army lists, and using FUBAR’s core activation and orders rules. It meets most of what I want in a sci fi game. One option you might want to look at is using 1st generation of Warzone. It’s my absolute favorite sci fun skirmish game. Extremely cinematic and customizable. It’s a bit lacking in the vehicles section, but still workable. Dark Elves Invade The Old World!